This tutorial will show you how to create a 3D vase in 5 minutes with the Illustrator CS2 3D Revolve Tool. It is fun and easy! The 3D Revolve Option window should pop-up and looks like the image below. Click on More Options if the lower portion window is not showing. You can leave most of the settings as default, but add an additional light spot by clicking on the New Light icon and drag it to the lower left corner as shown. Enter 35 for Blend Steps, maximum Blend Steps is 256, higher Blend Steps will have a better rendering quality but will also increase the file size. Now use the Ellipse Tool, create a flower like the image below. I have a very simply flower illustration here, but you can create anything you like. Drag the flower to the Symbols Library Pallate to create a new symbol. If your Symbols Pallate is not showing, press Ctrl+Shift+F11 or go to Windows > Symbols to show Symbols. With the vase object selected, in Appearance Pallate, double click on the 3D Revolve effect icon(f) to change the 3D Revolve Options. When the 3D Revolve Option window pop-up, click on the Map Art button. Check Preview option to preview the result. At the top where it says Surface, use the arrow buttons to locate the surface that you want to Map Art. Notice there is a red wireframe on your object which shows you the surface you’ve selected. In this case, it is 4 of 5. From the Symbol drop down, select the symbol that you’ve created in the previous step. You can position and resize the symbol as you want. You can also create multi-surface Map Art by selecting the Surface then the Symbol. Click OK when you are happy with the result. That’s it! 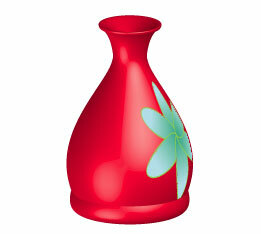 With just 3 simple steps, I just created a nice 3D Vase with Illustrator 3D Revolve Tool.